Get Ready for the 5th Serving of The Soup Bone Golf Tournament! Florence Peters was a dedicated PAWS of CNY (formerly Sunshine Friends, Inc.) volunteer. Flo was a special woman who loved dogs and was a committed member of our organization. Flo and her husband Jim started an annual golf tournament event several years ago, and the tournament now lives on in Flo’s memory. 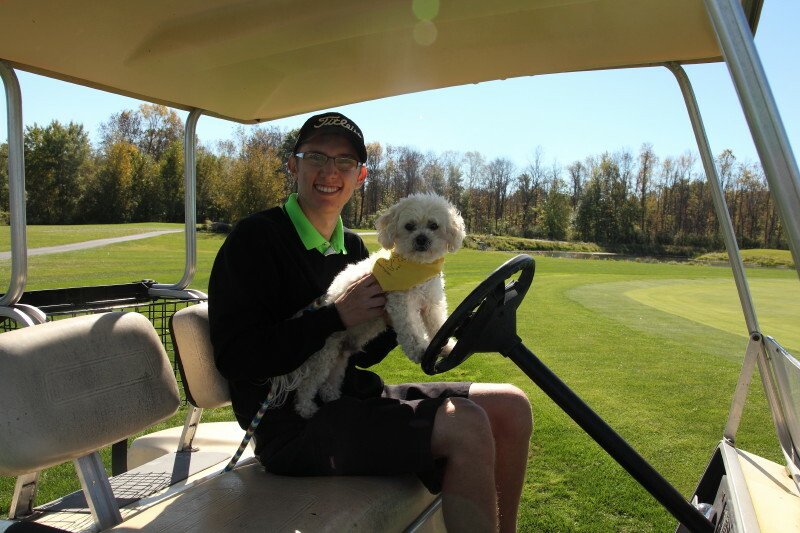 For the past four years, the Soup Bone Foundation has been kind enough to donate a portion of the event’s proceeds to both Hospice of the Finger Lakes, and PAWS of CNY. This year’s Soup Bone Golf Tournament will be held on September 25th at Millstone Golf Course in Elbridge, NY at 9:00 am. Hundreds of golfers and lunch guests will be attending this year’s event. Please help PAWS of CNY to support this year’s Soup Bone Tournament with a purchase of a Ball Drop Raffle raffle ticket! The event’s ball drop has been a huge success for the past four years! Raffle tickets are on sale for $5 each or 5 for $20. Each raffle ticket corresponds to a numbered golf ball. When the balls are dropped onto the course from the top of a fire truck ladder, the closest to the pin will win $1000! Second place wins $500, third place wins $200, and fourth place wins $100! Contact us for information on purchasing ball drop tickets. Please help us to make this year the biggest and most successful tournament yet! P.S. : Want to know why the event is called the “Soup Bone?” Read Jim and Flo Peter’s story here! PAWS of CNY volunteers Kathy Reynolds and Jessica Marabella had an opportunity to give a presentation to a team of Girl Scouts in Cortland about the benefits of pet therapy. The volunteers discussed the mission and focus of PAWS of CNY, including what a therapy dog does, where they go, what type of work they do, as well as the certification process. On June 3, PAWS of CNY volunteers Peggy Byrne and her Golden Retriever Ellie and Alison Bene and her Pit Bull Mix Router visited the Family Tapestry Student Support Group at the Pastime Club in Syracuse. On Wednesday, May 18, PAWS of CNY Volunteer Joy Hawksby and her Golden Retriever Keno gave a presentation on the benefits of pet therapy at Oswego Industries. The organization is a private, nonprofit organization located in Fulton that provides programs and services to adults with disabilities. 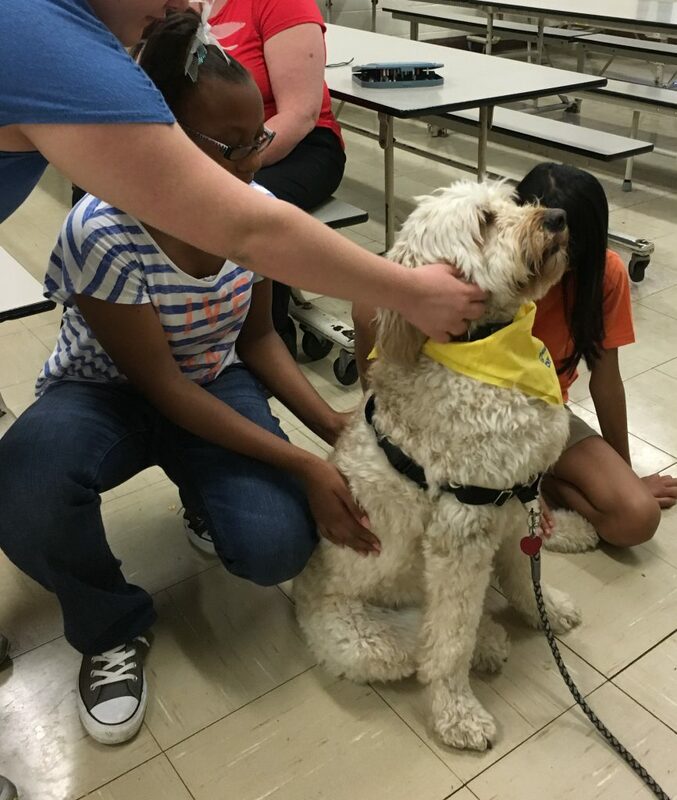 PAWS of CNY volunteers recently had an opportunity to provide both wellness and education services at the same time. Volunteers participated in a pet therapy session at Liberty Resources in Cortland. To learn about the benefits of pet therapy, the session was observed by a class of 15 public health students from Onondaga-Cortland-Madison Boces interested in learning about the benefits of pet therapy.